WOW – The Fordhall Community Land Initiative is the WINNER of the ‘Against All Odds’ Morgan Foundation Award, winning a staggering £25,000 towards the trusts work. The Morgan Foundation Entrepreneur Awards are designed to find a new generation of role models – whether they are new businesses, young entrepreneurs or social enterprises. They were also looking for a special person or business that has overcome obstacles and succeeded ‘against the odds’ and the competition was tough. 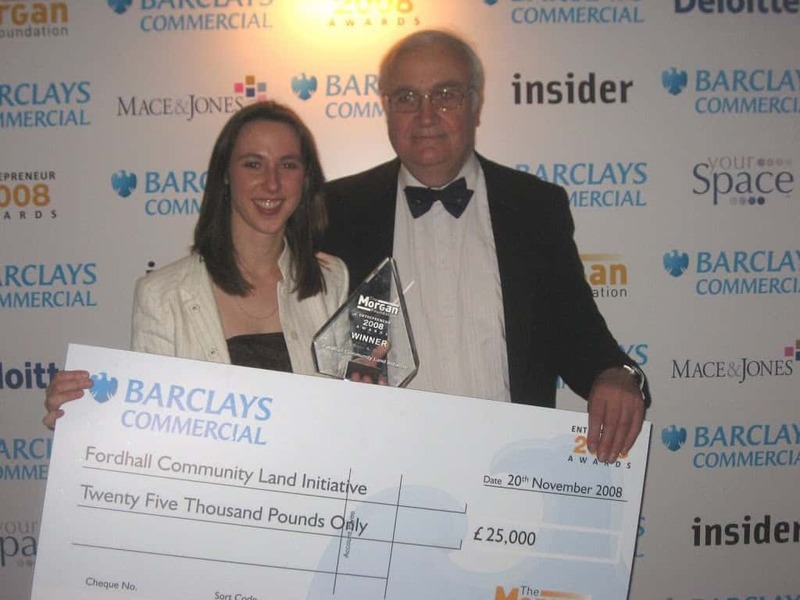 Steve Morgan presented the award to Charlotte on behalf of the Fordhall Community Land Initiative last Thursday evening. He said the competition had been extremeley tough and the decision for this category was particularly difficult. Other finalists included Tom Dowling, All Together Now, Sara Murphy, Macey and Bond Marquee Company, Peter Cousins, Brighter Futures Workshop, Dan Cundall, NMC Design and Print and Clare Molyneux, Open the Doot Theatre in Education. It demonstrates that people do care about our farmers, they do care about their food, and they do care about our beautiful English countryside. We hope the Fordhall Community Land Initiative will go on to teach many more children about their food and where it comes from. The funds will help with the progression of the Intiative at Fordhall, continually utilising it for community benefit. One of the biggest forthcoming projects is to renovate the farm buildings. The hope is that this will house a new indoor classroom for school visits and a small local food tea rooms. The recognition for all the hard work from volunteers and supporters can not go unnoticed. But of course, an enormous thank you must go to Steve Morgan and the judges on the awards panel for giving this award to the Fordhall Community Land Initiative. Social Enterprise can make a difference and great things can be achieved, even when the odds are against you. Congratulations on that award and your photo was quite delightful. Great!! I am really happy for you! you have won that award – another feather in your cap! So proud of you! And a huge “thank you” to all your Volunteers for all their hard work! Best wishes for 2009 are coming your way from Germany.